Converting an existing garage into a living area is a great way to free up some valuable space in your home. With house prices continuing to rise, combined with the high cost of moving, buying a new home is very expensive. However, you might actually be living in your dream home already; you just need to change a few things around to realise it! There are a lot of ways to extend a home, including building an extension, adding a conservatory or going up and moving into the loft space. But with garage conversion costs being affordable for many people, this is often the best option. Such a project makes even more sense if you don’t really maximise the space in your garage and use it more as a junk room. There are a number of benefits in choosing a garage conversion as a way to extend your home, the main one being that it’s fairly cheap to do. 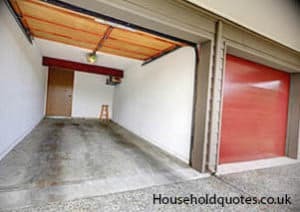 If you’re lucky and have a double garage, you can even convert half the space, keeping somewhere to park your car but still benefiting from a new room. One of the great things about converting an existing structure is that you don’t need to lay new foundations or build walls from scratch; something that will save a lot of money. In addition, many garages already have electricity and this will reduce your project’s cost even more. When compared to building an average extension, a garage conversion is the obvious choice. For example, a brand new three by four metre extension could cost upwards of £17,000. A standard garage conversion, however, should cost between £4,995 and £7,500. Building costs for a garage conversion are minimal because you’re working with an existing structure. However, there will be some major alterations to make, so before you start to gather quotes, consider some of the following points. The most obvious alteration will be the removal of a garage door and adding a weather-tight replacement. This is relatively simple to do because, in most circumstances, the space only needs blocking up. If you’re adding in a small window too, this should cost around £1,300. Doors and windows are both essential parts of making your garage feel like an extension of the house. The size, aspect and location of the room will determine how many are needed. On average, a door or window will cost £500 – £600, though you may pay more if you’re looking for bespoke and high quality finishes. Get Your Garage Conversion Quotes Today! Even if you want a plush carpet or are going to install a beautifully tiled floor, you’ll probably have to pour some new concrete first. This is especially true if the garage is old and the floor’s uneven. To have a new slab professionally laid will cost about £1,000. In the majority of cases, an internal structure of stud walls will be built inside your garage to create your new room. Insulation can then be added between these walls and the existing structure to increase energy efficiency. The average stud wall costs £750, and your build costs will be determined by the number you need. One factor that can add unexpected costs to your build is having to run new utilities into your conversion. A lot of garages have electricity, but most won’t have gas or water. If you’re changing your garage into a bedroom or living room, you’ll only have to factor a few extra outlets into your budget. However, if you’re planning a grand new bathroom or kitchen, then plumbing and gas pipes may need to be installed. Adding a new electrical socket shouldn’t cost more than £100, and if you’re using contractors from Ratepeople.com, you can negotiate a good price if more work’s required. Incorporating gas or water plumbing becomes more expensive, and if you need to move pipes, the work could cost between £1,000 and £3,000. The exact cost of converting a garage will depend on a variety of factors, including the extension’s new use and the quality of finish you’d like. For example, though you might get a great new living room for around £6,000, if you’re putting in an expensive kitchen or bathroom, then costs will be far more. There may also be administrative costs to pay; if you’re paying for an architect and project manager, for example. You should also consider any additional expenses for loans, not only the initial fee but the ongoing interest too. However, with the cost of extending your home being so high, garage conversions remain a fantastic way to get more room without having to move. Your information and guidance on the cost of garage conversion is very useful for someone like me who is the first time looking into this option to extend more living space to the family. Many thanks. Get Your Garage Conversion Quotes NOW!